A record number of hen harrier chicks have been fitted with satellite tags in an effort to discover why their numbers have declined so significantly. The RSPB said 24 young birds had been fitted with transmitters in the UK so far - double the number tagged in 2016. The charity hopes the tags will help reveal where the birds go and more about the dangers they face. 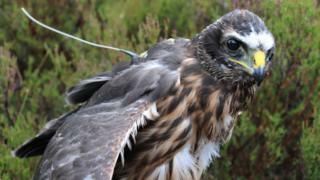 The majority of the tagged birds are in Scotland, with others in Wales and the Isle of Man. None were tagged in England in 2017 due to poor weather. The population decline is down to habitat disturbance and illegal killing, according to the RSPB. Scotland remains a stronghold for the birds, with 80% of the UK population. Current estimates suggest there are about 600 breeding pairs across the UK. The west Highlands continues to provide a home for the majority of Scotland's breeding harriers, while they can also be found in Orkney, the Hebrides and Dumfries and Galloway. RSPB project manager Blanaid Denman said: "By satellite tracking more hen harriers than ever before, we'll gain a clearer picture of where these birds are spending their time and what exactly is happening to them. "We've already discovered previously-unknown nesting and winter roosting sites, as well as being able to pinpoint where natural deaths and illegal killings have occurred. "It's both infuriating and utterly heartbreaking to see these beautiful birds, year after year, disappear off the radar. Something needs to change." The RSPB is calling for grouse moor licensing and a stop to heather burning on deep peat and inappropriate drainage to preserve the birds' habitat. Hen harriers prey on red grouse chicks as part of their diet, and conservationists claim gamekeepers kill the raptors to preserve grouse stocks. Countryside groups and the government say grouse shooting is a legitimate activity which brings significant benefits to the rural economy. The Hen Harrier LIFE project is now in its third year. It has received extra funding from cosmetic company LUSH through sales of a specially-created "Skydancer" bath bomb. Paul Morton, from LUSH, said: "Monitoring as many youngsters as possible as they take their first flights across the length and breadth of the country is vital for their long-term protection. "The message is loud and clear: a nation is watching and will have the welfare of each of these birds close to our hearts."